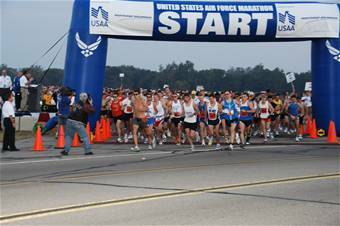 Nearly 7,400 runners came out beneath clear sunny skies for the 12th Annual running of the U.S. Air Force Marathon here. Nathan Peters of Grayling, Mich., was the overall winner of the full marathon posting a time of 2:30:47. Gone were the damaging winds, remnants of Hurricane Ike that rocked the region just a week ago. Although base crews worked all week removing all signs of damage to the course, many in the Miami Valley are still feeling the effects of the storm as Gen. Bruce Carlson, Commander of Air Force Materiel Command, acknowledged in his opening remarks. "There are still many in our community without power or in homes without roofs," General Carlson said. "I urge you while running today to keep them in your thoughts." Despite the previous week, turnout bested the previous record set last year by nearly 1,000, more than a 15 percent improvement. The event kicked off Friday with a 5k race hosting more than 1,000 runners on the campus of nearby Wright State University. The university also hosted the Sports and Fitness Expo and Gourmet Pasta Dinner at the National Museum of the U.S. Air Force. The full marathon, along with a full marathon wheeled division, half- marathon and 10k, launched Saturday morning from the museum grounds. As runners for the full marathon stood abreast the starting line, a procession of an F-16 Falcon then F-15E Strike Eagle followed by an F-22 Raptor flew overhead to thunderous applause. The winner of the wheelchair category was Glen Ashlock of Brooklyn, Mich., with a time of 1:38:18. It was his third consecutive win in the USAF Marathon. "It might be my best time in any marathon," he said. "We had a lot more riders this year who really pushed me especially early on. Everyone treated us very well and made us feel very welcome." For the male winner in the full marathon, this win followed 3rd and 4th place finishes in his two previous runs in the Air Force Marathon. "All my PRs [personal records] have come here, so I felt it was bound to happen sometime," said Mr. Peters. "I'm just thankful this was the year." This was the 10th marathon for the University of Michigan sophomore who got his inspiration from his mother who battled brain cancer for 10 years. Amy Klein, a high school teacher in Lexington, Ky., running in her 6th marathon was the female winner in the full marathon category finishing with a 3:06:22. She remarked the good weather and flat course made for a good run. Getting to run with "all the military personnel, just being close to them," was inspirational for Ms. Klein. Her future plans, at least in the near term, are to "go home and go to sleep." A special runner this year was Army Capt. Ivan Castro, a U.S. Army Special Forces soldier who was blinded during a mortar attack in Iraq in 2006. While recovering in Bethesda Naval Medical Center, Captain Castro became interested in running again. Having run in the Army Ten-Miler and the Marine Corps Marathon, today's completion of the Air Force Marathon makes for his completion of his first "Tri-service trifecta" for running. "It was an awesome, awesome event," he said about the run today. "You guys put on a really good show here." Captain Castro, who runs with Army Lt. Col. Fred Dummar as a guide, does all his training at Pope AFB, N.C., and called his ability to run today a "team effort." "It is an honor to run with him," said Colonel Dummar. "I think I get more out of this than he does." The captain said this Air Force Marathon was his "first but not last." A list of all the winners follows below. All times cited are unofficial.